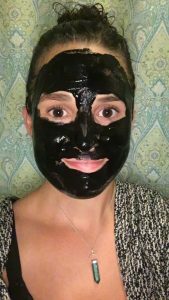 Activated Charcoal and Aloe Vera Face Mask | Ridge's Stitches | Health Coach. Yoga. Clothing. This is a perfect mask for the summer. The aloe vera is great if you’ve been soaking in the sun. The activated charcoal acts as a natural detoxifier. I didn’t really get into face masks until recently but they are a total game-changer. Face masks are a wonderful way to incorporate a little more self-care into your routine. This one is so simple and if you’re on an activated charcoal kick like me, you’ll already have some activated charcoal in your pantry! I used aloe vera juice (the stuff that is in the middle of the plant) and mixed that with some activated charcoal capsules. You can buy a bottle of aloe vera gel online. You can also buy your activated charcoal capsules online but I would probably get the bag next time since it comes with a scooper and you don’t have to spend time breaking up the capsules. It’s honestly pretty messy so make sure you don’t spill it everywhere because it’s hard to clean. You can also use this mask on bug bites and poison ivy to get the itching to subside! The activated charcoal acts like a sponge by drawing out any impurities on the skin. It also gently exfoliates and smoothes the skin. You can keep it in the fridge for a week or so and use again a few days later. Apply to face and let sit for 10-15 minutes until dry. Wash off but be careful not to get it all over your towels. It’s a bit hard to clean!